Is your bathroom boring, outdated, and ugly? Is your bathroom bringing down the charm and value of your home? Well then it’s time for a bathroom remodel! Take your bathroom from drab to FAB with custom bathroom vanity cabinets from Danner’s Cabinet Shop, your professional custom cabinet experts! Your bathroom has probably had the same look for years. Even if you’ve updated the sink and maybe even changed the color of the walls, the basic look hasn’t changed much. If you have not kept up with the latest modern bathroom cabinet design, you might not realize the number of different styles and designs available to you. You bought your home with a single sink wood vanity and have always stuck with that style. 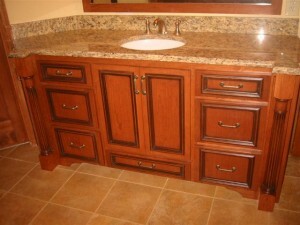 The fact of the matter is bathroom vanities come in many different shapes, sizes, and styles. From the most basic single basin vanities to double sink contemporary works of art with an air of luxury, you have a wide selection of bathroom vanities to choose from. Maybe the epiphany finally came when you realized that avocado green was no longer the “in color” for a modern bathroom vanity. Maybe it was chic back when John Travolta was lighting up the disco dance floor…but these days, not so much! The fact is that times change and what worked in the past will eventually becomes outdated. Whether you are looking for a contemporary, traditional, elegant, or trendy bathroom makeover, adding a custom bathroom vanity can completely revitalize the look and feel of your bathroom. We specialize in all bathroom remodeling projects, from the tiniest projects, to major bathroom renovations. We feature high quality craftsmanship that not only meets, but exceeds your expectations! We build custom bathroom cabinets for everyone in Minnesota, including those in Andover, Anoka, Blaine, Bloomington, Chanhassen, Chaska, Corcoran, Deep Haven, Eden Prairie, Edina, Elk River, Ham Lake, Maple Grove, Medina, Minnetonka, North Oaks, Plymouth, Ramsey, Richfield, Rogers, Shakopee, Shorewood, St. Paul, Wayzata, and more.